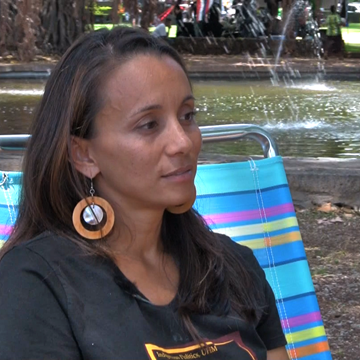 Dr. Noelani Goodyear-Ka’ōpua (2012), an assistant professor of political science at University of Hawai’i-Manoa, is a staunch supporter of Hawaiian independence and “aloha ‘aina” (love for the land). In this interview, Noelani discusses how her familial experiences and the islands political history have grounded and shaped her work as a scholar and teacher. Her course offerings, which span from introductory politics of Hawaii to subjects such as “Contemporary Native Hawaiian Politics” and “Decolonial Futures,” reflect this perspective. Noelani co-founded a Hawaiian culture-based public charter school, Halau Ku Mana, as well as an organization for Hawaiian independence, MANA (Movement for Aloha No Ka ‘Aina). To document political land struggles land educate youth on recent Hawaii resistance movements, Noelani, together with students of MANA, collects orgal histories of activists from various land struggles. This project is called Mo’olelo Aloha ‘Aina: Stories of Love and Struggle for the Land. In this Journey to Justice interview, I began by asking Noelani about where she was born and raised. Running time approximately 37 min.